Have you ever imagined what it would be like to run your own baseball team? WTOP talked to two baseball writers who got that chance, and who wrote a book about their experience. WASHINGTON — Anyone who’s ever played fantasy baseball with any seriousness has probably dreamed of running their own baseball franchise, making all the decisions to help guide the franchise to a championship. That team, in your dreams, is probably the Nationals, or the Red Sox, or the Cubs, not the Sonoma Stompers — a low-level independent league team you likely never heard of before you read this sentence. But that’s the team that offered baseball writers Ben Lindbergh of ESPN (and Grantland, at the time) and Sam Miller of Baseball Prospectus the chance to do exactly that. The two spent the summer of 2015 in the sleepy, lesser known wine country of Northern California building, scouting for and advising the Stompers, one of four teams in the Pacific Association, one of the several handfuls of independent leagues around the country not affiliated with Major League clubs. It’s the kind of place where the two could sign “spreadsheet players” who had fallen through the cracks of the MLB Draft, and experiment with extreme shifts, including five-man infields and four-man outfields. 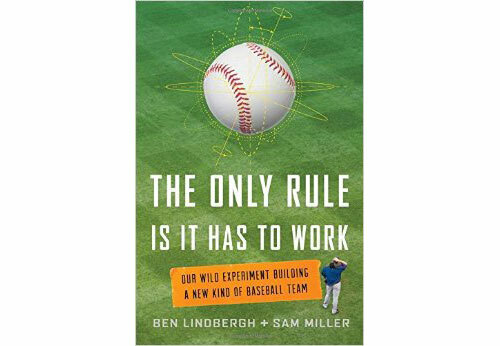 The end result is their book, “The Only Rule Is It Has to Work,” a hilarious, honest, thorough study of how the analytical and instinctual sides of baseball — often seemingly at war with one another — fit together in their Indy ball test kitchen. Lindbergh and Miller joined WTOP on the phone from their respective homes in New York and California for an in-depth discussion. As they did in the book, Lindbergh and Miller alternated answers in our chat (beginning with Ben), which ranged from the origins of the project to some of the surprise history made along the way in the midst of their unpredictable year. Listen to the full conversation above, and pick up a copy of the book, already a New York Times best-seller, on bookshelves now.